Black and Blue HeartThe new album produced by Nick DiDia and Bernard FanningAfter six decades on the road, an album can almost write itself. It might arrive in the space of a few months, fully formed in vision and texture in the mind of the vigilant creator. But it takes a rare combination of talent and circumstances to realise that vision as vividly as Black and Blue Heart. "I'd met Bernard [Fanning] years ago," Russell Morris remembers. The Powderfinger frontman came backstage at one of the Australian rock legend's countless gigs to pay his respects with a mutual friend. "But It wasn't til I moved up to Queensland last year that we sat down and started talking. 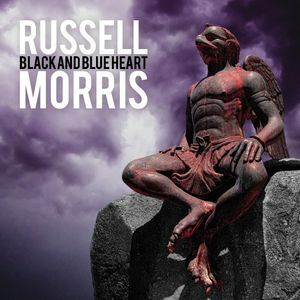 "The warmer environs had already exerted a strange, organic influence on the songs Russell was writing in the wake of the platinum-selling, ARIA-winning blues-rock trilogy — Shark Mouth, Van Diemen's Land, Red Dirt Red Heart — that so spectacularly relaunched his career from 2012 onwards. "I thought I was writing an album which was rootsy, bluesy, almost psychedelic, but nothing came out the way I expected." He gave the demos to Fanning and producer Nick DiDia (Springsteen, Pearl Jam, Powderfinger) and "they rang me back within two days," Russell says. "They said, 'We can't stop listening to these songs. This will be a great album'. So I said, 'Let's do it'. "The two producers speed-dialled their dream studio team: guitarist Dan Kelly, drummer Declan Kelly and, from Fanning's touring band, bassist Matt Englebrecht and keys player Ian Peres. Perched between the tropical bush and panoramic ocean views of La Cueva Studios near Byron Bay, Black and Blue Heart found its rhythm fast.That raw energy commands attention from the ragged count-in of Ain't No Angel, slammed down with splashy drums, overdriven Hammond organ and vintage vocal echo. From that bracing opener to the sinuous, conspiratorial whisper of Is There Anybody Out There?, this extraordinary album begins to climb yet another peak for one of our all-time greatest singer-songwriters. For their part, the producers deflect back to the source material, a rush of pure inspiration that Russell credits to the stunning career-reset of his Shark Mouth trilogy. “I went back to the blues, where I started in the early ‘60s, and that allowed me to reset all the quantum things in my writing and in my body. It kickstarted my creativity. I think that's how this album happened so fast and so confidently.“The band, the studio... it all fell into place beautifully but the songs came from where I came from. I went back to the well and I drank from the fountainhead, and this is the result.”Limited tables are available for dinner in the venue prior to the performance. Call 8340 0744 to reserve your spot today. Please note: reservations are limited and diners will have the only guaranteed seating in-house.